I didnt fall in a hole. I’m alive and well, thank you very much. Sometimes life gets busy and I dont have time to post on the blog. Ive been quilting and sewing and bird watching. And reading and playing and walking and cooking. You know, regular life. I love what you did with the border! That looks really cool! I especially love the border. I really like the cubes. And the colors are so neat … the bright green really stand out. That is beautiful with that lime green accent. I really like the border. Or should I say fabric choice! It is stunning!!! The border treatment is great. This one is a great big WOW! Love that border – really spices it up! How pretty and I, too, love the border technique. Do you have a photo of the original fabric? The original fabric is along the top and left borders. That part is not cut in smaller pieces. Love it…the border really was the finishing touch it needed!!! WTG!!! Love the quilt.. The colours are my kind of colours. Youre welcome. My border inspiration came from the 2nd OBW book. Love, love, LOVE your OBW!!! That’s the coolest one I’ve ever seen; those are my very favorite colors! Can’t wait to see how you quilt it. Where do you find out how to do the outlined cubes? 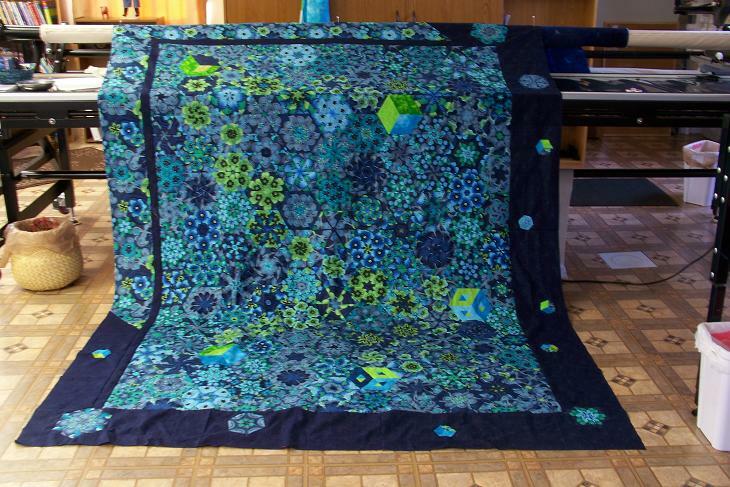 I love the colors in your quilt and the way you did the border. Thanks. Directions for making the hollow cubes and other cubes are in the 2nd book, One Block Wonder Encore. I love the effect of the OBW, like an abstract deisign of snowflakes. What is the pattern of your original one block? I dyed a large piece of fabric and would like to try this? OMG I am so glad to see that done!!!! It looks beautiful!! SO COOL. The border is perfect! Ugh it has been so long how are you? Doing fine Connor, glad to see you typing again. Have missed you. And thanks for being my original inspiration! Awesome quilt!! Great fabric, and very nice blocks. Love the border. It is really a WOW! This is so beautiful. I’m going to have to try one of these. Guess I better read about picking fabrics first like you did. I’m sure that’s the key. The fabric is in the outside border. I bought it at JoAnn’s.